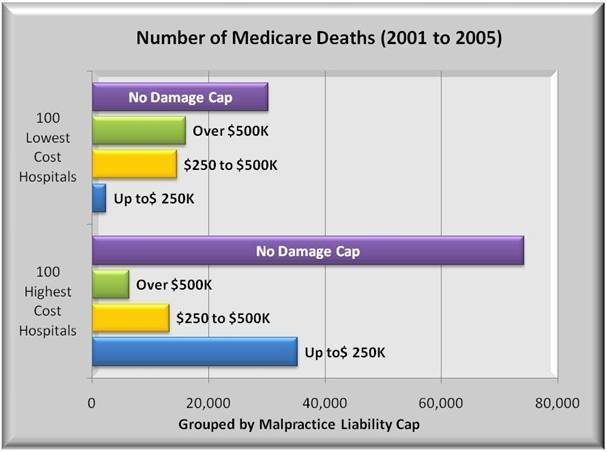 Does tort reform lower medical costs? The Robert Wood Johnson Foundation wrote a paper titled Medical Malpractice: Impact of the crisis and effect of state tort reforms. That report shows states that have passed tort reform to limit awards of noneconomic damages. This analysis compares data from 100 highest cost and 100 lowest cost hospitals and groups them by those states. 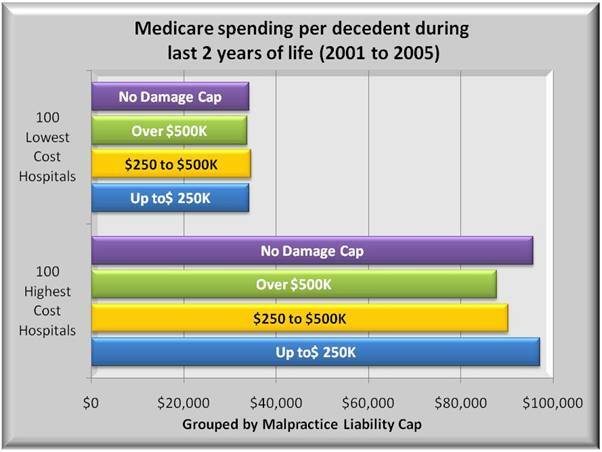 The graph below compares spending in the last 2 years of Medicare decedents at lowest and highest cost hospitals arranged into 4 “tort” classes: in states with no tort reform, those with caps over $500K, those with caps $250K–$500K, and strict states with caps of no more than $250K. For both lowest and highest cost hospitals, tort reform had virtually no cost differences for Medicare decedents during last 2 years of life. For seniors, there appears to be little or no correlation between tort reform and medical savings. Does tort reform reduce medical care? Another measure of medical care may be outcomes. Extra efforts (and cost) may prolong life, especially for seniors. In 100 highest cost hospitals, there were 130,000 deaths while 100 lowest cost hospitals incurred 65,000 deaths. One tentative conclusion is that chronically ill seniors may favor higher cost hospitals in hopes of getting extra care. Measuring tort reform by outcomes is less conclusive. One might expect that defensive medicine would improve life expectancy due to added, if wasteful procedures. But the data show a mixed result. In states with moderate tort limits, there were fewer deaths at higher versus lower cost hospitals. But in the extreme, or states with either no limits or very strict limits, there were more deaths in the higher versus lower cost hospitals. It would be tenuous at best to conclude that tort reform has any meaningful impact on life expectancy. Does tort reform affect hospital quality? The Dartmouth study uses Medicare data to compile costs and quality for hospitals. The 200 sample hospitals in this analysis were derived from this Dartmouth data. Using that data, the graph at left compares the technical quality measures of those 200 hospitals. 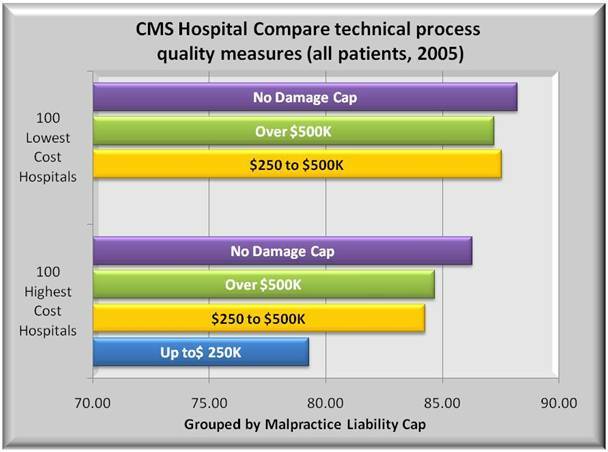 In this graph, there appears to be an INVERSE relationship between cost and tort reform. The higher quality scores ALL were in the lowest cost hospitals, and quality declined for all hospitals in direct proportion to the extent of tort reforms. Maybe this whole cause and effect is backwards. The accepted argument is that tort reform is needed to reduce defensive medicine and lower costs. Rather, a logical argument is that lawsuits or threats occur because quality is in fact low. While tort reform may be desirable, it may not be as important as reforming hospital quality.